With the new iMac models, Apple released three new accessories – one of which is the visibly improved and refined Magic Trackpad 2. Though the mouse has always been my personal choice in navigating around Mac computers, the trackpad is a great piece of hardware, way better than its horrible predecessor. The Magic Trackpad 2 seems more like the trackpad fitted in the MacBook. We – along with many others out there – think that it was fitted to give iMac users the same feeling and experience in the MacBook and iOS devices. As a testament to Apple’s commitment to familiarity and them striving to provide the same kind of intuitiveness and quality experience to their users, the company equipped the Magic Trackpad 2 with multi-touch features, along with Force Touch, which is already in the MacBook trackpads. Basically, this feature is like the iPhone 6s and iPhone 6s’ Plus 3D Touch. You can buy it online from Apple at $129 – it’s by no means cheap, but it could be worth it if you are looking to replace your old one. Purchase it and you will receive the trackpad, along with the Lightning connector which is used to charge it. Unlike its predecessor, it has a built-in battery that only requires a couple of minutes of charging to work for over several hours. 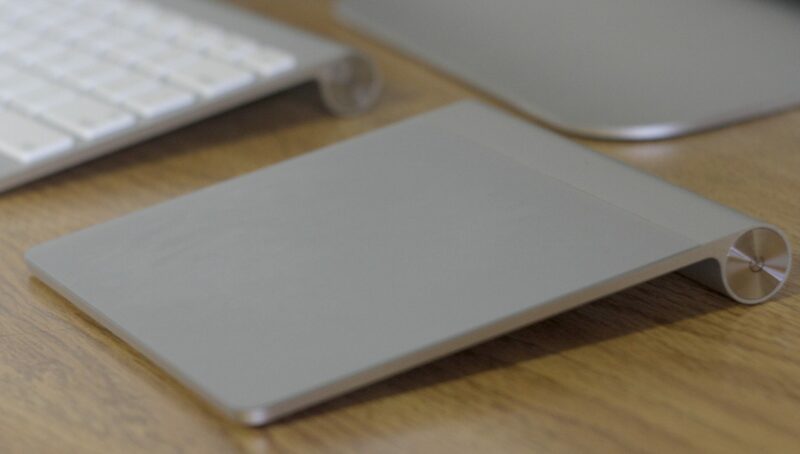 The Magic Trackpad 2 thankfully looks like a trackpad, not an ugly ramp like its predecessor. However, it’s still sloped from one end to another. It is noticeably larger at 6.3 inches wide and has a depth of 4.52 inches. This is the previous Magic Trackpad. Note the differences. The larger surface area makes it friendlier to the fingers compared to its predecessor. This makes it easier to move your fingers around the device and in doing what you want to do – it almost felt like using a MacBook. The design looks impeccable – it fits well with the iMac and the other accessories you have on your desk. It’s glass covered and pure white – like most Apple devices, it looks pleasing to the eyes. it is also made of aluminum, making it extremely durable and giving it a silvery appearance. The task of connecting it with my Mac was a pretty easy one: all you have to do is find the power switch on the rear of the device, switch it on, and turn on your Mac’s Bluetooth connection. They automatically pair up, but if they don’t, you will have to simply click on the Bluetooth icon on the menu bar and make the Mac find your device. And yes, you don’t have to do this: once you turn on your trackpad, a pop-up message will appear, saying that it is ready to be used via Bluetooth. If Bluetooth decides to act up and refuses to pair with your Mac, simply use the Lightning connector. If it still doesn’t work, make sure that you have upgraded to OS X El Capitan: its product page does not list it as being compatible with earlier versions of the OS X – we all know how Apple makes its software and devices obsolete after a year or two. Again, let me reiterate: I’m a mouse guy, not a trackpad one, so I had a bit of learning curve. Add the fact that it introduced new Force Touch features, it was rather difficult at first. Anyway, I have no complaints with it as it felt like home. You will need to tap with a single finger for a single click, and tap ONCE with two fingers to right click. It’s going to be confusing for most users though, especially if they’ve barely been using a trackpad. After an hour of trying to figure things out, I was seamlessly using the device. It’s perfect in using for the Mac’s built-in apps, such as Maps, Notes, and Mail. If you own an iPhone 6s, the whole thing is comparable to the “peek” and “pop” feature, which comes in handy in the Mail app. Regardless, I loved it – its former installment didn’t even allow you to click anywhere, like this one. Though the device is great in its own right, it poses a few ergonomics problems, at least for me. Though I had no problem setting it up and using the Force Touch feature, I had to put it in different places to find the position that worked well for me. It also takes way more effort to use compared to the Magic Mouse. In any case, it’s also not an option if you’re aiming to play games on your Mac. Though native app support is good, other third party app developers have yet to make their apps compatible with its Force Touch features. Anyway, unless if you’re playing games on the Mac or are having trouble getting used to trackpads, pick the Magic Trackpad 2 – it’s a great device and worth the rather expensive $129.